I know this is the second Thai recipe in a row, but this is actually what we had with our Glass Noodle Soup, and this is always really tasty. The kids can’t eat enough, and neither can my wife or I since it is just so flavorful and tasty. We have gotten Larb Chicken at our local Thai place for some time and are really happy every time we get it. 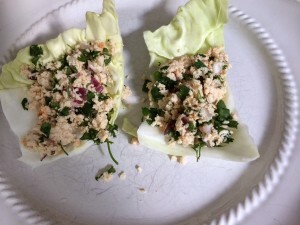 We found a recipe for Larb Chicken that we think is pretty awesome. It always turns out great, and has so much flavor. My kids just eat it with a fork, but my wife and I put it in some lettuce or cabbage and eat it sandwich-style. A few changes that we make are, instead of the Thai roasted chili paste, we use Sriracha. We don’t use thai chiles or mint leaves either. We forget how much we like this meal until we make it everytime, and the best part is that we can make it beforehand and just grab it afterward as a quick meal, or a great lunch.